Alexander had many talents, writes classicist Prevas (Xenophon’s March, not reviewed, etc. ), among them a certain genius and a definite courage that was most useful on the battlefield. 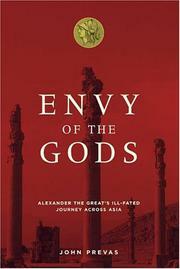 Yet, the author adds, Alexander was “incapable of achieving that measure of self-control necessary in order to bring about his own personal happiness.” Whether personal happiness was one of Alexander’s objectives Prevas does not say, but the great lord was certainly content to be considered a god in his time and to be treated with all due awe and reverence by a retinue of sycophants, who followed him as he pressed eastward toward India. Though his most senior general advised him to accept the Persian ruler Darius’s offer to yield Asia Minor in exchange for a pledge not to invade the Persian homeland, Alexander refused the counsel and ended up conquering a wasteland—and squandering the best of his men in the bargain. Frustrated and hateful, he destroyed the Persian capital when he did not need to do so; often drunk, he contrived to “extract the maximum suffering not only from the local people he encountered along the route home [from India, where his invasion petered out] but by inflicting the greatest number of casualties on his men as well.” His men eventually extracted payment in kind: before he was 33, Alexander died at Babylon, and Prevas agrees with other revisionist scholars that he was very likely the victim of poisoning at the hands of members of his inner circle. One of several recent books devoted to Alexander, thanks to interest spurred by a forthcoming Oliver Stone film: this is also one of the best—a welcome addition to the literature surrounding the renowned conqueror.